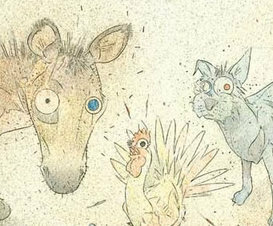 Follow the inspiring adventures of a dog, cat, rooster, and donkey who prove it's never too late to start over. Well along in years already—and worried that life may have passed them by—these four spunky animals decide to begin new lives as traveling musicians. Their comic escapades and dogged attempts to harmonize will amuse young and old alike. And you'll want to thank the Brothers Grimm for offering a valuable message about following your dreams. The inspired musical score brings this ultimate musician's tale vividly to life.